We know our Polar A300 users have been patiently waiting for the Smart Notifications and we’re finally happy to say it is now just a firmware update away. So, attach your A300 to your computer and update your A300 firmware to 1.2.127. After the firmware is up to date, you should turn the notifications ON from your A300 or from the Flow mobile app, since they are OFF by default. Turn the smart notifications on from your A300 by going to Menu > Settings > General settings > Smart notifications. Remember to sync your A300 with your mobile after the settings are enabled. For the mobile app, you can find detailed descriptions how to take the Smart Notifications in use depending on your operating system from the Smart Notifications (iOS) and Smart Notifications (Android) documents. Also, from this day onwards along with the 1.2.127 firmware, the Polar A300 is also Polar Balance compatible. You can now complete that healthy lifestyle with personalized daily activity goals to help you reach your goal weight. 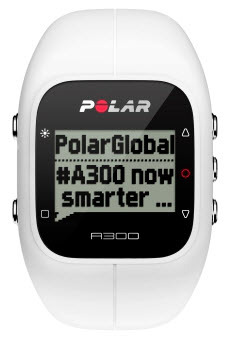 To follow up on the bug fixes, check out the Polar A300 Release Notes.